The Wildtrak is basically just a souped-up version of the already impressive Ford Ranger, fitted with an array of unique body treatments that will make many others in its class look pedestrian. Some people are saying that those same body improvements look as if the Ranger put on some make-up, but the vehicle’s new trimmings really do accentuate its muscular lines and koboy attitude. Body-colored tailgate cladding with embossed Ranger branding, their box and roof rails with aluminum bar accents are attention grabbing. Frame-mounted aluminum side-step running boards along with a body-colored sports bar mounted on the pickup bed add to the Wildtrak’s tough-yet-sophisticated looks. Completing that look are a set of beautiful 16-inch Wildtrak alloy wheels, an under-rail bedliner, a front bumper overrider, body side cladding with Wildtrak decals and illuminated scuff plates with the Wildtrak logo. 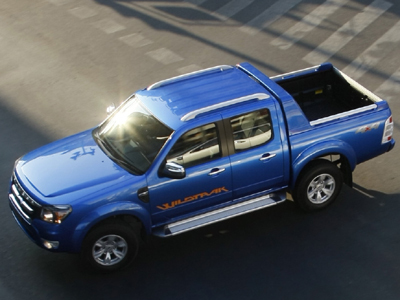 Tough on the outside, the Wildtrak is still comfortable on the inside. The seats feel like they’re giving you a hug, thanks to their wonderful ergonomics. The body shell is well-constructed too, and will pretty much shoo away and prevent all of that outside noise from ever reaching your eardrums. Powered by a 2.5-liter Duratorq TDCi common-rail diesel engine that produces 330 Newton-meters of torque at 1,800rpm, the Wildtrak can gallop off from an idle position, and can make short work of steep climbs. Rest assured, it doesn’t need a running start for you to feel the force of the engine.